It’s time to welcome 2019! The most interesting New Year’s Eve traditions in Kyoto! Do you want to know what New Year’s traditions there are in Kyoto? If you want to know how the people of Kyoto spend the New Year, come join Vanessa as she finds out! 2018 has almost ended, so it’s time to welcome the year 2019! And there are special traditions in Kyoto in store for welcoming the new year to the old capital. There are many traditions, like eating soba noodles on New Year’s Eve, eating zoni soup based on white miso with Japanese rice cakes in it (symbolizing a satisfactory New Year), and making “osechi,” food especially for the New Year, of which each family has their own version. After the 108 bell rings of the Joya no Kane ceremony at Chion-in Temple have been rung, the New Year has officially started in Kyoto. There are many events that take place in Kyoto during this time, all the way to 15 of January when it’s time to eat New Year’s porridge. So, it’s time to get the champagne ready! New Year’s Eve means soba noodles! 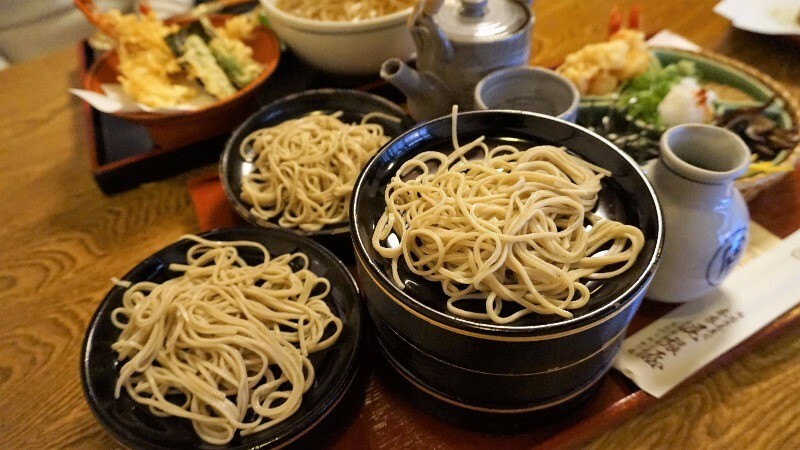 At most families, one of the most cherished New Year’s traditions is eating soba noodles on the New Year’s Eve. The long soba noodles are thought to symbolize long life, and because of their chewiness, you’re also said to be able to get rid of bad luck by chewing them. Remember to eat the noodles before the year changes, otherwise eating them is said to bring bad luck instead of good. 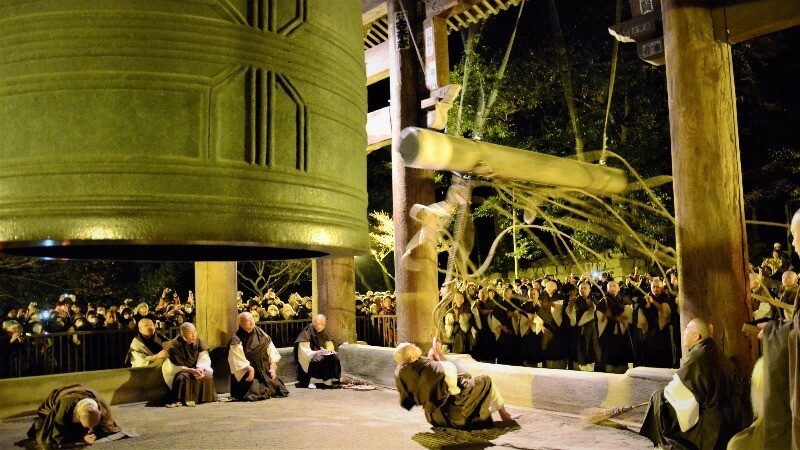 Joya no Kane is a ceremony that takes place at many temples in Kyoto, and the temple bell is first rung 107 times on New Year’s Eve, and then one last time as the year changes at midnight. Why 108 times? The reason can be found in Buddhism (of course) as the number 108 is thought to be the number of desires people have. This traditional ceremony is also done as to wish everyone a happy and safe New Year. A new year also means you have to do the first visit of the year to a shrine or a temple, and this is called hatsumode in Japanese. This is done in order to wish for the new year to be a peaceful one. 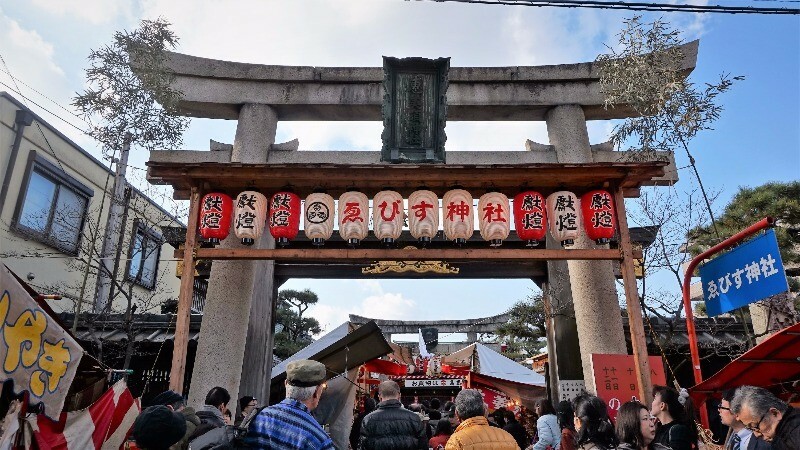 The most popular hatsumode spots in Kyoto are Fushimi Inari Shrine and Yasaka Shrine, and these shrines get really crowded during the New Year’s Holidays, so be careful when you go to them! Kyoto’s zoni soup is different from most others in Japan because in Kyoto white miso is used to make the soup. The soup contains round pounded rice cakes whose roundness is said to symbolize health and satisfaction, daikon, taro, and bonito flakes. 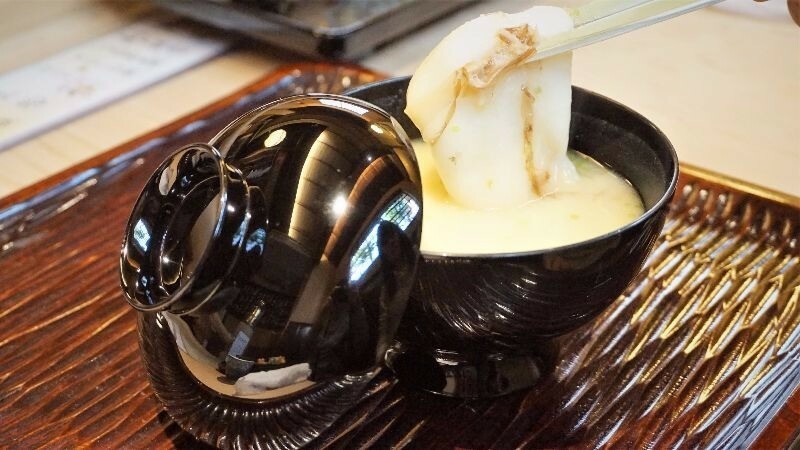 Every region of Japan has their own take on zoni-soup, but because of the white miso used in Kyoto’s soup the taste is sweeter and more elegant than most of the others. 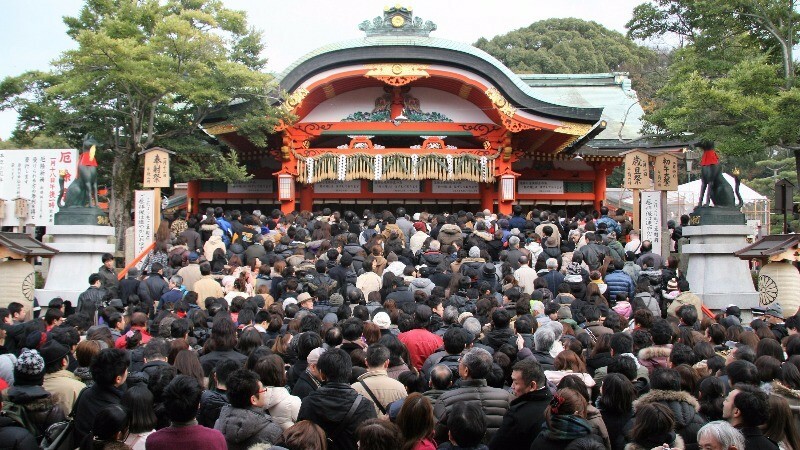 Every year on the fourth of January, a ritual called Kemari Hajime is held at Shimogamo Shrine. This shrine dates back to the Heian period, a thousand years ago. Like you can see in the picture, the ritual consists by the priests kicking a ball, and every year a great number of people go to see this ritual, so the feel at the temple is joyous. 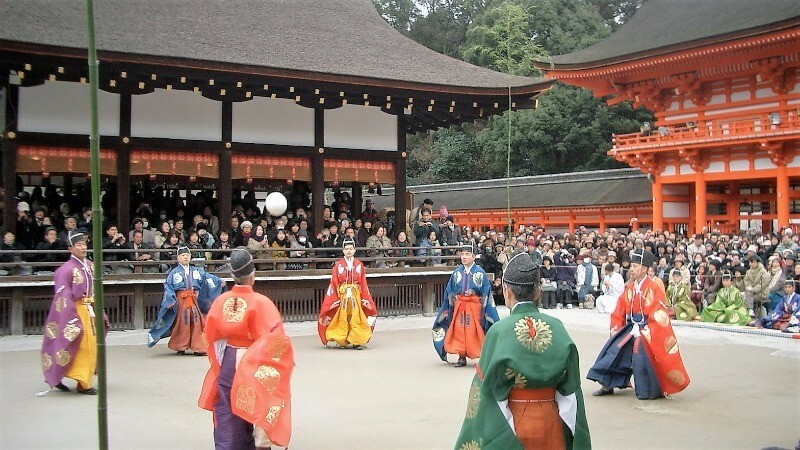 If you have time on the fourth, consider going to Shimogamo Shrine to see some Japanese-style football! At Gion’s Ebisu Shrine, they have a festival every 10th of the first January of the year, for the health and prosperity of their parishioners. After the festival, you even have a chance to buy a bamboo shoot to decorate and bring health to your home. There are also many food stalls close to the shrine, so you can also get some nice street food as well! 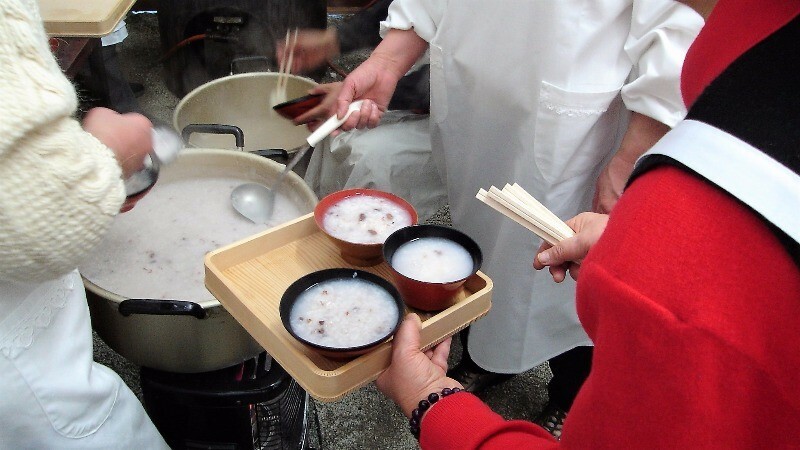 New Year’s rice porridge festival takes place on 15 of January at Shimogamo Shrine, and at this festival, you get to eat rice porridge containing rice cakes and red beans. It is said that you will be healthy for the whole year if you finish your bowl of porridge! So line up for the red bean rice porridge, but remember to finish it, so that your year will be a happy and safe one! I’m Taiwanese, so the New Year’s traditions of Kyoto are really interesting to me because they’re so different from mine. I especially like the traditions and foods of the New Year in Kyoto, because they’re so unique. So 2019 means another year of great festivities and events in Kyoto, so now it’s time for me to wish you all a Happy New Year!